Quite some time ago, me and some friends of mine decided we'd really like to play some Mordheim! The difficulty with this however, is that ideally you need an entire ruined city to play in. So we started buidling one. Having the most experience of us in building terrain, I gave some workshops on making buildings, and sometimes we come together to continue our construction for an entire day. Having few time in between to build, the process is slow but one day we'll get there. 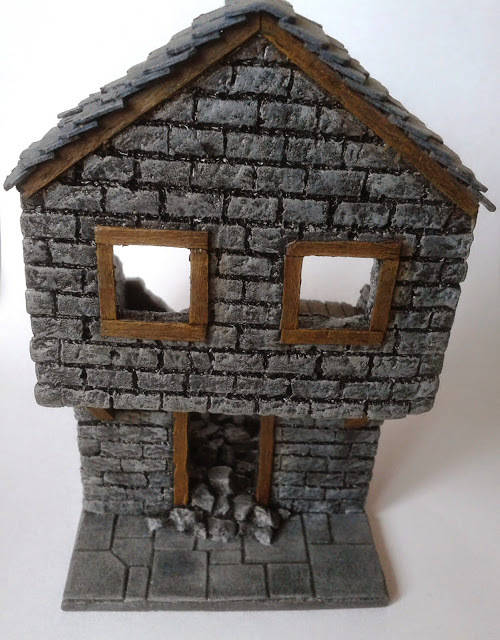 In this project log I'll post the scenery we are building, and gradually add battle reports once our campaign get's started, so you can see our city and warbands in action! During the campaign, I'll still add pictures of any new scenery or models we'll make. It once was a prosperous city in the Empire. It was however, full of corruption, debauchery, crime and some say home to large cults dedicated to the Gods of Chaos. One day, a twin-tailed comet appeared in the sky, the meaning of which was hotly debated by scholars. 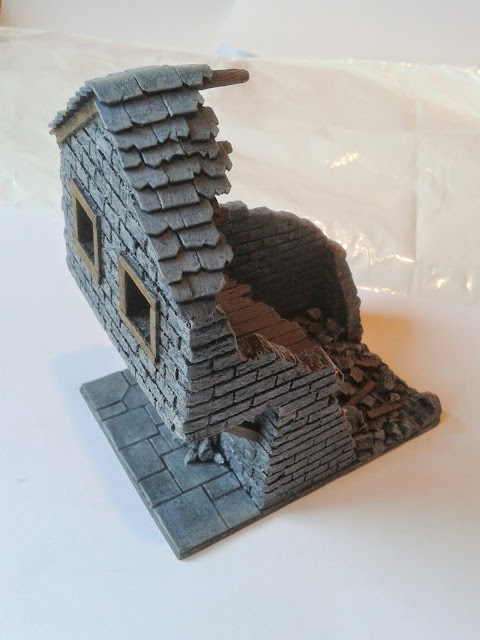 Astromancers predicted the comet would land in the city of Mordheim, and when it did, it set the enitre city ablaze! Many buildings where ruined, countless people lay dead, some of whom had come to the city falsly believing the comet heralded the second coming of Sigmar. Today, some people say the comet was a punishment of Sigmar, for the vile inhabitants of the wretched city. Others speculate is was a cruel joke of the Chaos Gods. Whatever the cause, the city lay in ruins, but was abundantly scattered with the rare substance known as wyrdstone (warpstone) magic in solid form! Wizards and Alchemists pay copious amounts for even small pieces, so the city became a haven for men seeking their fortune within it's crumbling walls. The wyrdstone also attracted the interest of the Skaven clan Eshin, as well as vampires and worshippers of Chaos. It has become a dangerous place, full of monsters of chaos, a place were the dead don't rest easily and above all, a place ruled by the greed of men. 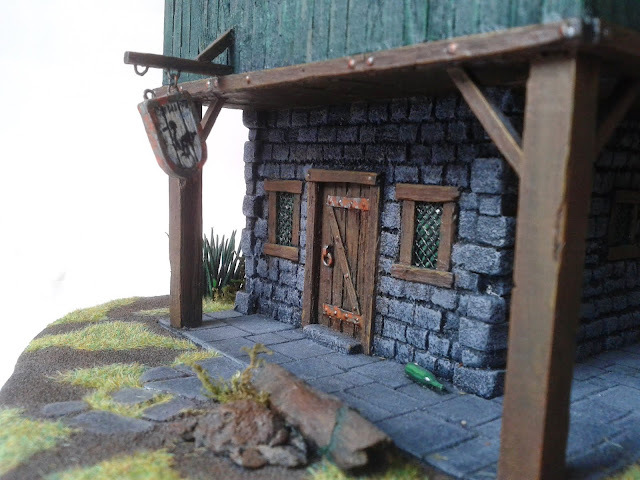 This is my oldest building, I started it construction before the plans of mordheim, but I made it so it stands quite nicely both as a standalone piece on a battlefield and amongst other buildings within the walls of morheim. 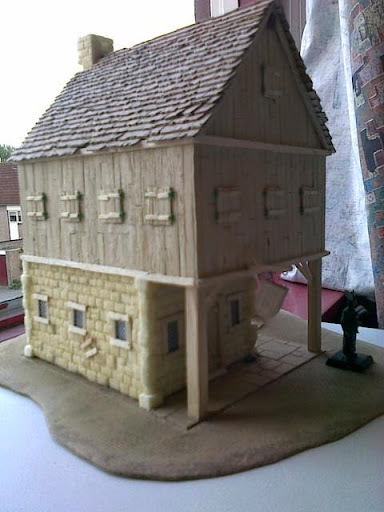 It can be separated from it's larger base, leaving it nice and compact to fit within the city. It was based on a cardboard skeleton, with planking added on the upper floors and a thin layer of foam on the lower. The roof was the most work, each cardboard tile hand-cut and roughed up. The windows are made of mesh on a paper background, with wooden borders. 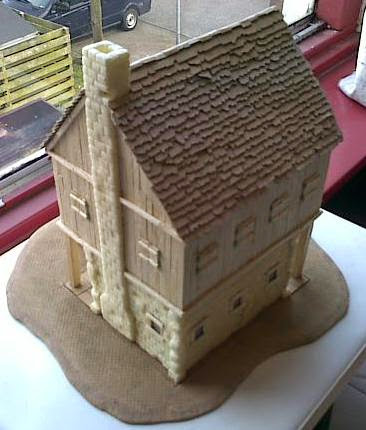 The foam was sealed using PVA glue. 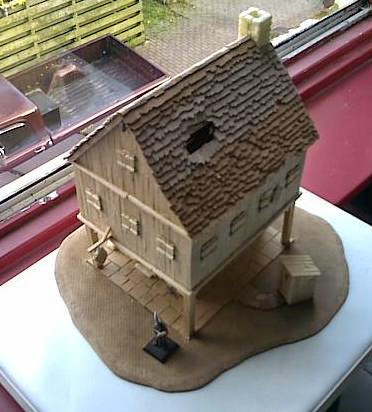 It is unpainted to show the materials I used. Last edited by Tha Tall One; 08-04-14 at 01:26 PM. wow...you want me to love you? because thats exactly how you do that. In a platonic sense, of course. I will modify the rules a bit to make it depend less on randomness and to balance certain warband builds more. It'll still be funny, but more fun! 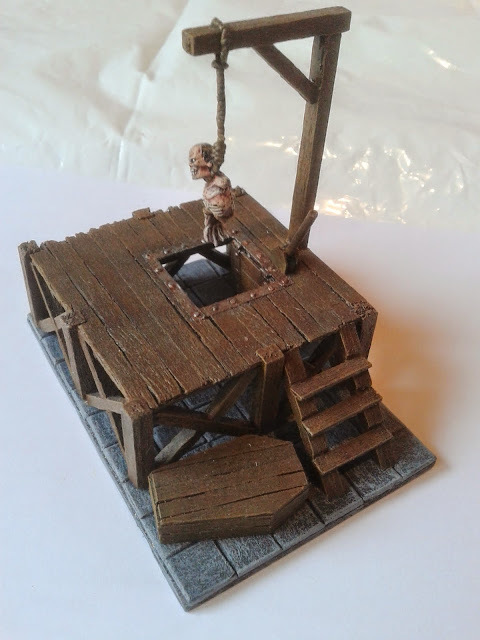 This is how we'll be using it in Mordheim. I approve of anything Mordheim. Your buildings are very impressive! I just have noticed the w.c. 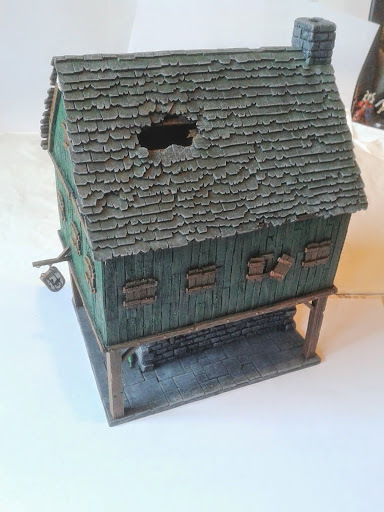 The outhouse is detachable from the base as well, so can also be placed somewhere in Mordheim. 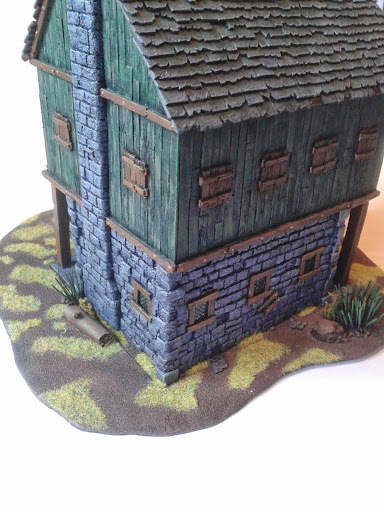 Here's a small building I did in a very short time. The walls are completely made of foam, hardened with PVA. 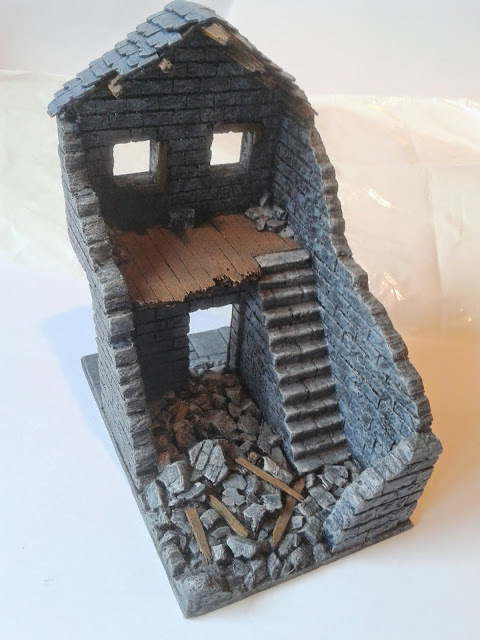 While the floor is thick with rubble, models stand still surpisingly stable inside the building. 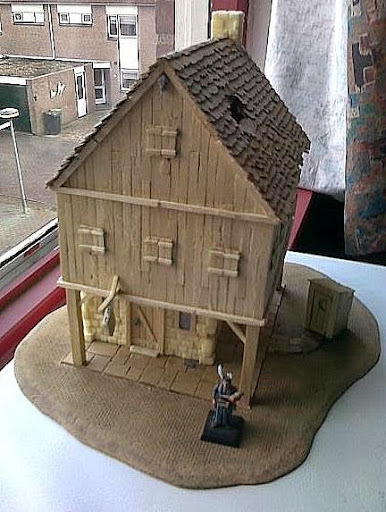 The small platform accessable by the stairs turn this small house into a formidable defensive position, as the stairway side of the house is the only direction in which can not be fired. Last edited by Tha Tall One; 08-10-14 at 12:40 PM. 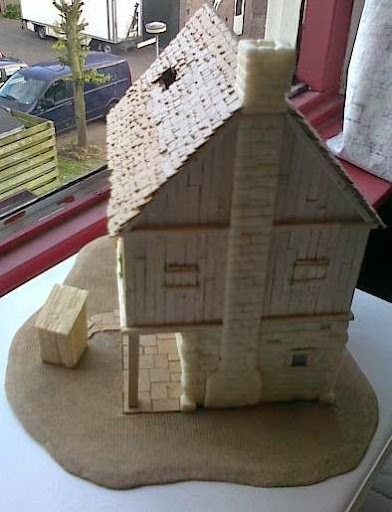 This piece is primarily made from matchsticks, planking and some thicker pieces of square wood. 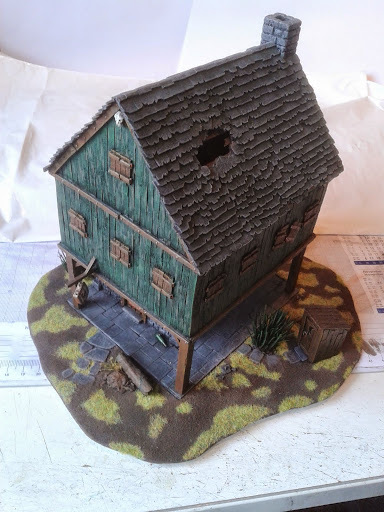 Put on a hardboard base with cardboard tiles. 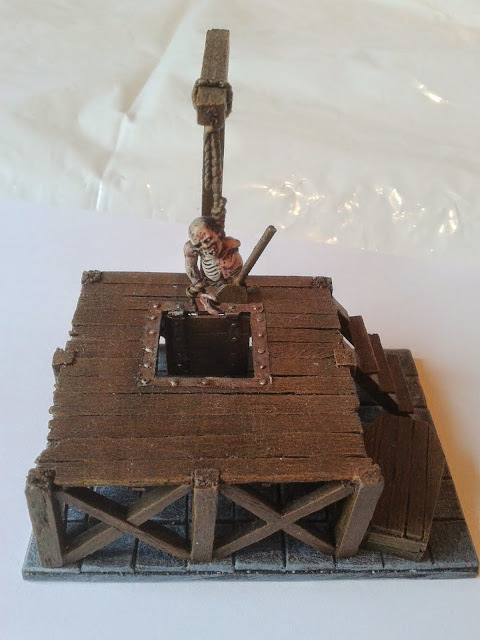 Hanging fellow from the zombie sprue, with the rope made from greenstuff, as well as the rope around the wrist. I'm not sure if this guy still hangs here from the day the comet fell, or if he came to be this way more recently... 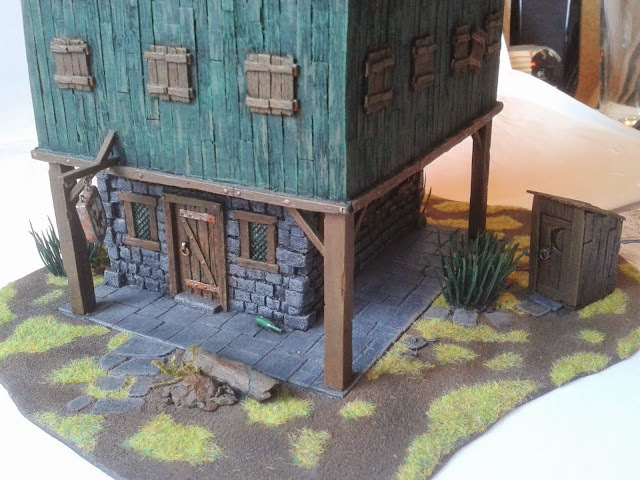 Anyway, it serves as a setpiece to fill some of the more spacious areas in Mordheim. Desperate warriors can hide behind it for some cover, or use it as a grisly elevated fighting platform. Really like it! Again, great stuff.